I love cooking with fresh herbs and some are almost always on my shopping list (parsley, basil, thyme). Herbs like thyme and rosemary give me no problems; they are hearty herbs that LAST. Parsley and basil, that’s another story. After dealing with a lot of slimy parsley and wasted money, I had an idea. Why not treat them like fresh flowers? It worked! 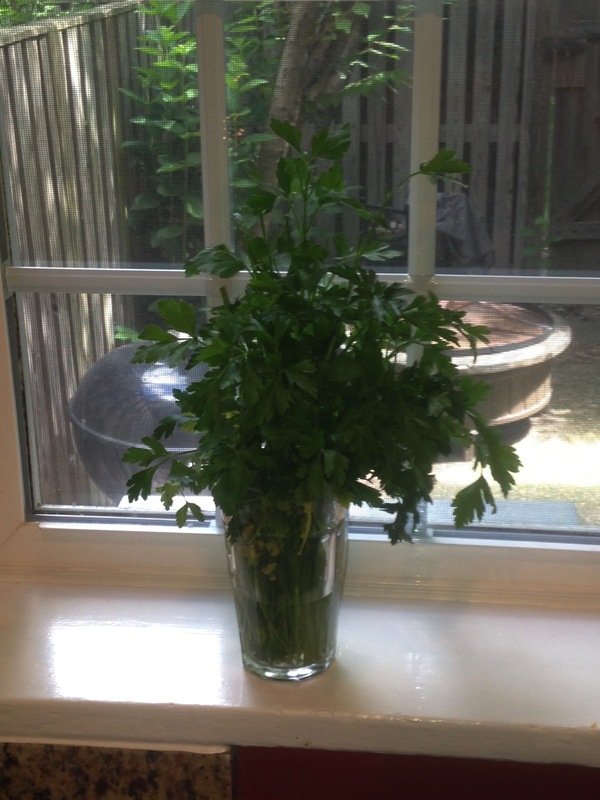 Now, whenever I bring parsley home I rinse it, cut the stems a bit and put them in some water by the windowsill. It looks pretty, can last a week or more and is easy to grab a bunch while cooking. Basil remained my nemesis though. As much as I loved it, I was tired of it turning black and shriveled within a day or two. The package said not to keep it in the refrigerator, but to keep it at 55 degrees. Maybe if I had a wine fridge I could be weird and throw herbs in there, but I don’t and it’s never 55 degrees in my house so now what? I tried treating it the same way as parsley and got a droopy, sad mess. SO i had to throw away half of it while cursing Basil and whoever wrote those 55 degrees instructions. Here’s what does work: chop your basil however you want it. Then toss it in a bit of olive oil. Make sure to coat all leaves, this keeps them from turning black. Then put the basil in a little sandwich baggie and freeze it. When you’re ready to use, pull it out. Since it’s in the baggie, it thaws really quick. Great tips! You could also freeze the basil in ice cube trays and then put the cubes in a baggie. The ice tray is also good for freezing extra meat drippings that are too good to toss.